Green Lantern is a very flawed movie-going experience. It’s by no means a “good” movie, but it doesn’t fall into the ranks of the “superhero movie gone wrong” league of the horrifyingly awful “Fantastic Four: Rise of the Silver Surfer” or “Daredevil”, or even the “close but no cigar” category like “Batman Forever” or “The Spirit”. Instead, in a much more tragic fashion, Martin Campbell’s Green Lantern is an obviously great movie buried beneath a very bad movie. 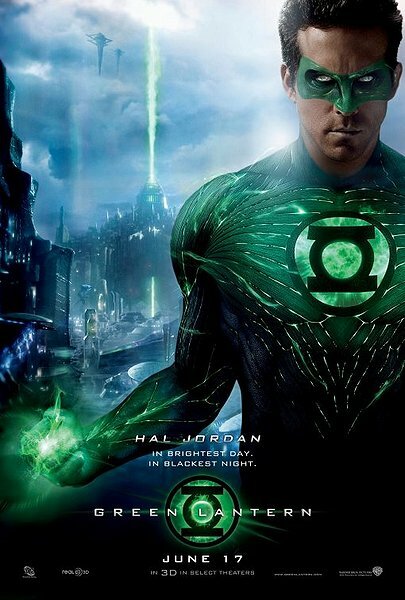 The movie follows the first human lantern, Hal Jordan (Ryan Reynolds), a jet pilot that is chosen by the dying lantern Abin Sur’s ring to be the next lantern. While this is going on an evil force known as Parallax is endangering the universe and takes hold of the scientist Hector Hammond to destroy Hal. Green Lantern is one of those movies that tries to do way too much with way too little time. The way I see it either Martin Campbell had no idea how to interpret the character of Hal Jordan and his world, or, the more likely alternative, there were far too many hands pulling and molding Green Lantern in the development process. The film opens with your typical exposition scenes where we’re supposed to get to know Reynolds’ interpretation of Hal, but they’re so forced they end up not serving a purpose at all. We’re given characters that the film never uses and given a “dead dad” back-story for Hal that’s handled so poorly and inappropriately cheesy it’s laughable. Pretty soon we’re whisked off to the planet Oa that’s basically a “headquarters” for the lantern corps, which, ideally is supposed to be the set-up for an awesome series of training sequences. Nope, basically what you se in the trailer is all you see in the film. There’s a punch, kick, a few lines of exposition regarding how Hal’s powers work that we’ve already been told, Michael Clarke Duncan shows up, and in one awkward transition after another, we’re back on earth with our “established” hero, ready to save the day. Basically think Batman Begins, but Bruce only spends 7 minutes with Ras Al Ghul, the murder scene of his parents is done with cheesy black and white and sad music, and instead of the movie being 2.5 hours, it barely clicks over 1.5 hours, barely squeezing all the information in. I really believe the scenes on Oa could have been some of the movie’s strongest, had we gotten a clearer idea of how the world worked, who these other lanterns are, and went farther into Hal’s reaction to being a Lantern than “I’m not good enough”. There are a lot of great ideas on the page there, but none come to fruition. Unfortunately this isn’t a trend that changes once we get to earth. Much like Oa, if the movie just decided where it wanted to go and what the final product should look like, it would have been an awesome sequence of scenes that made for a comprehendible film. Peter Sarsgaard does a commendable job as Hector Hammond, which in theory is an awesome villain for the Green Lantern’s first outing. But in a way the movie just collapses under the potential. There’s a rivalry that’s hinted between Hal and Hector for the main love interest, and sadly it’s one of the most-emphasized parts of the film, but naturally it’s one of the least interesting things the film has to offer in a story about a guy who can make ANYTHING out of energy from a ring. The typical romance between Ryan Reynolds’ and Blake Lively’s character is one of the few things in the movie that does work. With the more outlandish nature of the Green Lantern’s powers, the movie does have a heck of a time trying to find a balance between the serious and the silly. I love the idea of a hero that’s so new to the idea of the ring that he forms things like a hot-wheel track or a flamethrower, and I think there’s an awesome, light-hearted and fun movie there. But it’s a bit more jarring when the movie switches from themes of a very dangerous battle that threatens to destroy the universe over to the love rivalry between Hal and Hector and then all of a sudden we’re tossed a whimsical, cartoonish action scene involving something zany coming from Hal and the ring. I honestly have no idea how you would do a serious Green Lantern film with Hal forming flamethrowers and gatling guns on the cuff of his mind, but there has to be a better way than the tonal mess Campbell chooses to use here. As I’ve said, there’s a really great story there, I love the ideas the film presents with green representing will and yellow (the color of Parallax) representing fear and the ensuing rivalry, along with the goofball nature of Hal Jordan and his self-esteem conflict presented. Overall, had there just been a lot of ideas extended and some ideas (love triangle, clunky exposition not on Oa) completely scrapped, we would have gotten closer to the better movie buried underneath. A lot of controversy went behind the film early on when it was announced Hal’s suit was going to be entirely CGI, and now that I’ve seen the final product, I can say I somewhat-totally-kind-of-stand behind the decision. On one hand, making the suit CGI brings about a whole lot of other problems because you basically have to make a lot of other things CGI, like the world of Oa, the alien lanterns, etc. Let it be said right now, some of the shots are phenomenal. While the artistic design of Oa isn’t particularly inspired, from a technical standpoint it’s created pretty darn well with a real actor having to interact with it all. The final battle with the Parallax cloud at the end that’s plastered all over the trailers is also gorgeous, and is one of the film’s better accomplishments considering I actually enjoyed the sequence. The suit itself is even pretty consistent, never looking remarkable, but only being distractingly bad in a few smaller doses. It is somewhat remarkable though that we are living in an age of digital effects that can do this sort of thing, in that a movie like this couldn’t exist ten years ago. However that’s where my praise for the movie’s special effects ends. When the CGI succeeds, it creates a gorgeous world that you’ll marvel at. When it fails though, you feel like you’re watching a PS2 game from 2004 in action. The chase sequence between Abin Sur and Parallax at the beginning of the film looks downright awful in spots, there are several places in the film where the effects just look unfinished, and as I said just sentences ago, a little more polish on the suit wouldn’t have hurt. For the most part the performances of the film work, but they’re never really anything special. Blake Lively is fun to look at, but gives it an uninspired run by the time it’s all said and done. Peter Sarsgaard is arguably the film’s best element, which is said considering how awkwardly that character is handled. Ryan Reynolds smirks his way through it although in his defense Hal’s never really given a personality that’s evident on the screen. Finally, it has to be said Tim Robbins, a normally great actor, takes bland to an awful new level as the senator, a.k.a. Hector’s dad, a relation that is nowhere close to believable considering the two actors’ 12 year age difference that looks more like 2 years age difference in the face. I felt bad for Martin Campbell by the time this movie was over. The guy’s super talented, as he managed to successfully reboot Zorro and James Bond twice, including the incredible Casino Royale, unfortunately it just seems to be a case of too many ideas being present at once to make a concise, cohesive, or even satisfying film. A lot of people have compared Green Lantern to this year’s earlier hit Thor, but unlike Green Lantern, Thor is considerably more fun, and you can actually reasonably describe to others what the movie’s story is. To top it all off, once Green Lantern does come to a somewhat pleasing ending when we’ve “wrapped up” all our story threads, we’re given a “Let’s make a sequel!” cliffhanger during the credits. If the film wasn’t already such a critical and commercial failure, I would have loved to see Campbell and the gang put their heads back together and learn from their mistakes for what could have been an awesome sequel based on the interesting concept they set up. Unfortunately (or fortunately, depending on how you see it) the film’s probably never going to happen, instead Green Lantern will probably just end up with a new reboot in three or four years. Green Lantern sets lofty goals, and for a brief glimpse you can see what Martin Campbell really had in store for us: an epic, charming, and campy superhero space story, a movie I’m sure audiences would have loved. But as it stands, Green Lantern is a short, bloated movie with too many good ideas gone to waste.